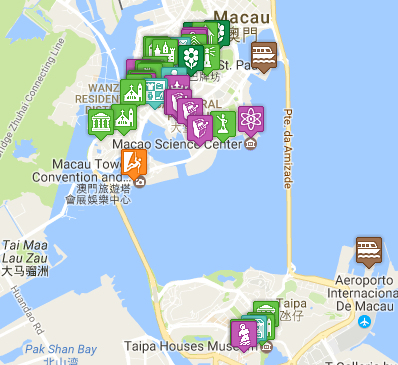 If you are visiting Macau for just a day, or longer you need to plan your trip to get the most out of the rich experiences Macau has to offer. Macau has lot packed into a very small area. If you already have a list of key places you want to visit or things you want to do, chances are just round the corner are more attractions worth seeing. Going to the Galaxy casino, why not pop over to Taipa village? Going to Coloane for Egg Tarts, why not check out the Temples in the village, or stop-off en-route to see the Panda’s or take a shuttle bus up to the A-Ma Cultural Village?